History of the brand: Kera Tamara was given as a bride to Sultan Murad I as a pledge for the peace in Bulgaria. Tsar Ivan Alexander long postponed this decision but in the end in 1738 Kera Tamara was forced to go to the Sultan. She bid long farewells to her loved places. Wherever she stood and cried from the drops of her tears magnificent vines grew to give fruit to extraordinary grapes. Colour: Sparkling pink colour with golden hue. Aroma: A complex aroma of red and black berries – raspberry, blackberry, wild strawberry and floral hints. Taste: Fresh and juicy, perfectly balanced body. 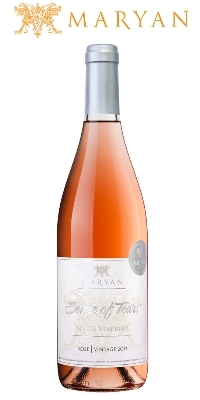 A rose with rich fruit and great density. Pair with eastern cuisine, pasta, eggs, lamb and goat’s cheese.